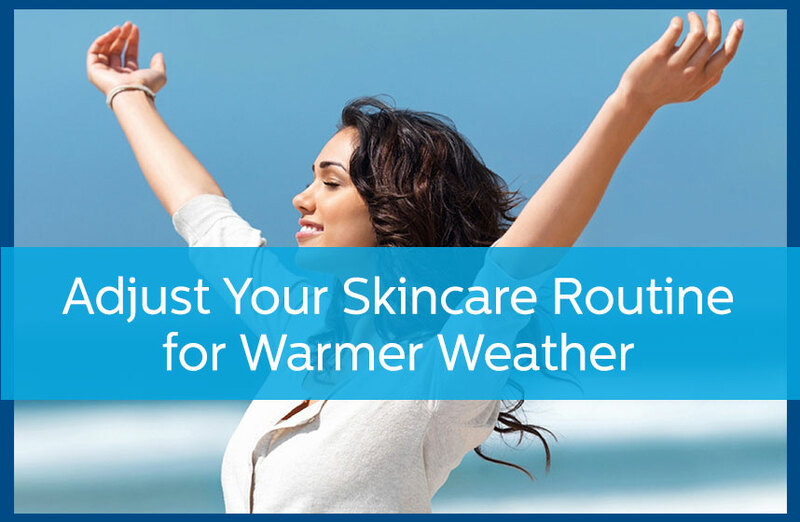 As the weather switches from cold to warm, don’t forget to transition your skin care routine so that you can keep your skin moisturized and protected from the sun while you are outside participating in your favorite recreational activities or hanging out with friends and family. Warm weather means dealing with heat, humidity and sunlight, which can cause clogged pores, dry skin, age spots, and skin cancer if you are not vigilant about protecting your skin. Thick moisturizers are needed in winter to combat the cold, dry conditions, but you do not need those same moisturizers in the summer because they will clog your pores. Instead, transition to a light, oil-free lotion that will keep your skin hydrated without causing breakouts. Remember to choose lotions, creams, and chapsticks that have an SPF rating of at least 15 and to reapply often, especially after swimming and sweating. For best results, choose sunblocks, lotions, and creams that offer protection for both UVA and UVB rays. Often times, these products state that they offer broad or full-spectrum protection against the sun. Choose hydrating body washes and facial cleansers that also remove dead skin cells. This can help keep your skin looking fresh, smooth, and hydrated so that you look your best in your new spring and summer attire. An increase in sweat and body oil can cause clogs in your skin pores, which can lead to unsightly acne. To keep dreaded pimples and blackheads at bay, consider using a good acne facial cleanser and spot treatments for breakouts. To keep your skin looking great and protected from the sun, remember to bring your lotions and sunblocks with you. Our dermatologists recommends purchasing the travel sizes of your favorite SPF creams and lotions so that you can reapply as needed throughout the day. If you have a chronic skin condition, like acne, eczema, rosacea, psoriasis, or another skin condition that makes finding effective summer skincare products difficult, our dermatologists at Avail Dermatology can help you. We can recommend the right sunblocks, lotions, and creams to keep your skin looking great and protected from the sun all summer long. For more information and to schedule an appointment, call us at 770-251-5111.